"Nectarines taste great grilled  all you need is some butter and brown sugar. Serve with vanilla ice cream and you have a quick dessert for a hot day." Brush each nectarine half with 1/4 tablespoon melted butter and sprinkle with 1/2 tablespoon brown sugar. Preheat the grill on medium heat. Place nectarines into an aluminum grill dish or directly onto the grill. Grill until lightly browned, turning occasionally, 3 to 5 minutes. See how to make grilled nectarines drizzled with a homemade raspberry sauce. What a delightful, light ending to a meal! 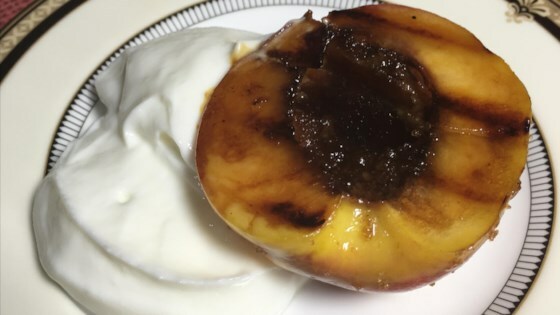 I served the nectarine with vanilla Greek yogurt, and it was delicious!